Th-INK-ing of You: Snowflakes Everywhere.. but not here! Hello my friends! I hope your week has been wonderful and that you are ready to enjoy this mid-December weekend! I have a card to share with you, which would make a great winter card, Christmas or other... and it includes a removable bookmark that slips over the front and back side of a page. I used this month's release from Our Daily Bread designs, Snowflake Background, Sparkling Snowflakes, and Bookmarks- Snowflakes. 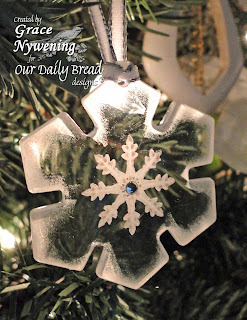 I also used the custom dies made by Spellbinders for ODBD, Bookmark Dies, and Snowflake Dies. I stamped with Stampabilties Pigment Ink in Royal Blue, and then clear embossed. I used the small bookmark from the set as my horizontal panel which holds the bookmark in place. I added a sheer ribbon and gemstones from Paper Studio. 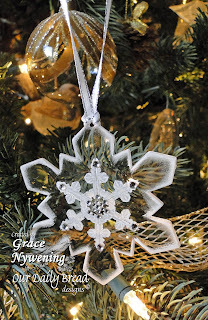 I also had fun playing with the Sparkling Snowflake Set and some acrylic snowflakes I bought at Hobby Lobby for only a couple dollars. I stamped these with white Stazon and sponged around the edges, and added bling. Unfortunately my ink is very old and was hard to work with, but I still had fun, and I share for the concept, in case you still are looking for last minute gift ideas. So I hope you in some way found inspiration from these projects today... and that you will enjoy a wonderful weekend. As I write this, I'm listening to the horrific story that is unfolding in Connecticut right now... not far from where I used to live. A shooter entered an elementary school, shot and killed his mother, a kindergarten teacher there, as well as 20 children and 6 other adults. What a devastating loss! It's hard to even think about preparing for Christmas when so many are suffering right now... not only here, but all over the world! However, we need to remember that humanity is flawed. We are NOT innately good... we are sinful in nature, and in need of a Savior. It is for that exact reason that God sent His one and only Son into the world. It was His perfect plan that His Son would be born of a virgin, live a sinless life, and be crucified on a cruel cross for the sins of the world. He would not stay in the grave however, and three days later, He arose, victorious over death and sin! His salvation is offered to ANY who will but believe and receive Him as their Savior! It's a FREE gift... and the thought that comes to mind as I mourn for these poor families who are suffering from the loss of loved ones today is it is SIN, that caused this... and the answer is standing with outstretched arms, inviting all who will, to come to Him. It's no coincidence that our government has been pushing God out of everything. It seems to me that the more our country pushes God out of our schools, out of text books and history, removes His name from our money, removes monuments that have His name on them... the more of this sinful action will be seen, and the less of His protection we will have, because after all, we've told Him to get out! It seems that people are blinded to the truth... and will run to any other possible solution... but they don't want to run to THE ONE and only TRUE solution. I pray that all will ponder these things as we celebrate Christmas, and take the time to truly thank the Lord for His indescribable gift. And please pray for these grieving families. I wish you and yours a most Blessed Christmas season! By the way... if you need a last minute gift for a stamper, or if you need your hubby to see a great idea for a last minute gift... ODBD Gift Certificates would please any stamper!!! Kelley is generously offering a special too! For every $50.00 Gift Certificates purchased, you get a $10.00 GC free!!! Check it out HERE! Thank you for sharing a beautiful project. Even more I appreciate your wise words. My heart is so heavy over the school shooting. I teach in a public school, and love the children so much! It is impossible to fathom the pain of that school and community. It is so terribly sad that we push God away and then get angry because He doesn't "stop" things like this from happening. Pray for light to shine in our schools. Beautiful card and stars Grace - and thank you for your wise perspective on the shootings - we woke to the news and were horrified. Thanks for sharing your beautiful projects and also for sharing the truth about our Savior. My heart and prayers go out to all those in Newtown, CT effected by this terrible and sinful tragedy. Lovely card, love how you used the bookmark to decorate the front of the card, and lovely snowflakes!! I so agree with your words, this country so needs to put God first instead of pushing him out of everything. 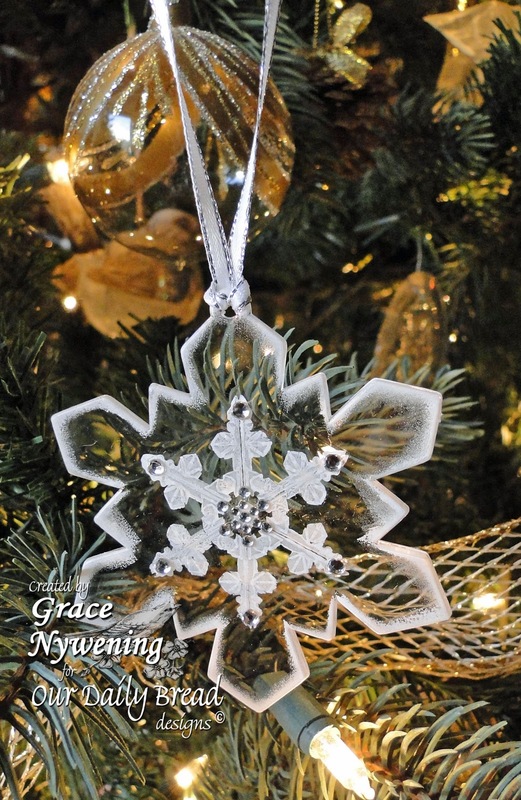 Your card and ornaments are beautiful Grace. 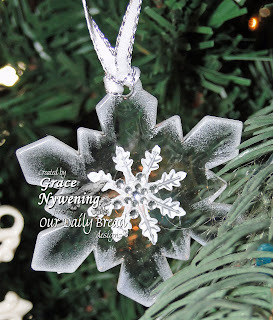 I have some oval acrylic ornaments that I bought years ago. I never thought about using ODBD stamps to decorate them, thank you so much for the inspiration! I am still feeling so terrible about today's news. One of my closest friends lost her daughter two days before Christmas a number of years ago. While losing a child at any time is unimaginably terrible, losing one during the holidays is even worse. I agree with everything you said. Now we need the Lord more than at any other time in recent history. Gorgeous work, as always, Grace! Yes, the shootings are a tragedy, and only God knows what good will come from it. It's hard to believe and understand that everything that happens is in His plans. But we have to remember that! Those little children and adults are now with Him in heaven, celebrating the birth of Jesus, and will be with their families as angels. Merry Christmas to all! Your snowflakes are beautiful. I totally agree with the sentiment concerning our taking God out of everything. I hate to think that our nation which was founded on CHRISTIAN beliefs and because of the necessity to find a place where we were free to worship as we choose has come so far as to deny God and shove Him out of every aspect - until we need Him! I feel that we need to pray and continue to pray for our nation to wake up before we really learn a hard lesson! Your blog is such an inspiration in many ways and that is one reason I love to make cards and check the blogs is because there are so very many Christians who do this! Thank you for being so open and vocal about your beliefs!! Грейс, наткнулась на Ваш блог и пропала!!! Такие красивые, пронзительные работы!!! Очарована, спасибо за такую красоту!!! Stunning Grace!!! 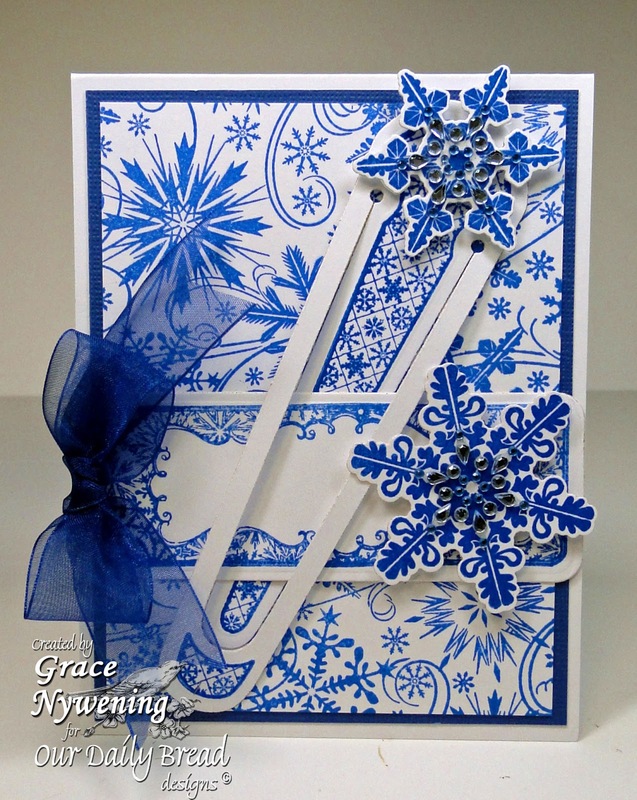 I just love the blue and white and how you used the bookmarks so creatively. Gorgeous!! Great idea for the ornament too!!!! Stunning projects...My tears and prayers are still flowing...Thank you for your heartfelt post on this.